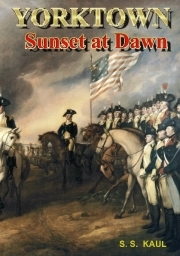 Description of "Yorktown - Sunset at Dawn"
This story, a work of fiction, is not about the Battle of Yorktown and has only a few references about it in the whole book. But Yorktown casts a long shadow over its fictional characters modelled over historical figures who are victims of their birth and destiny but still retain control over their lives. They are strong and resolute. They are not driven by the wind but drive the wind before them. They shape their own destiny to find love and happiness in spite of overwhelming odds. It is steeped in the historical background of the clash of nations and conflicts of duty and devotion. Reviews of "Yorktown - Sunset at Dawn"